What do you feed kids when they are starving? My younger two are growing like weeds these days & really need some extra food to keep them going. What do YOU reach for when the energy levels are low? Healthy or not? 1. Full meals I try to make sure they are putting away meat, vegies, carbs & good fat at each meal. This helps them make it to the next meal if we cannot snack without getting really cranky! 2. Fruit This is my first question to them. Have you had some fruit today? We don’t eat a lot of fruit at meals so they need to get this through snacks. Apples, oranges, grapes, bananas, pineapple etc Elizabeth loves apples & can go through a couple a day! 3. Trail mix Peanuts, raisins, & m&ms(a few) I think Joshua would live on this stuff. Daddy lets them add other stuff—like marshmallows. 4. Nuts We always have almonds in the house. Not everyone likes them but this is my little snack I have before fixing supper(when I am starving) so I don’t start snacking! 5. Yogurt & peanut butter dip We don’t do this often but is sure is good. Apples are delicious dipped in this. 6. Smoothies Nothing better on a hot day! 7. Popcicles Well maybe this is better. Freeze your smoothie recipe for a healthy alternative to frozen sugar. 8. Sandwiches Sometimes a little snack won’t do it. When we go for a bike ride or a long walk. I will pack peanut butter & jelly sandwiches. Also peanut butter & crackers or cheese & crackers are crowd pleasers. 9. Popcorn Regular or Kettle corn---mmmm love it! 10. Cheese sticks or slices of regular cheese Mix it up. 11. 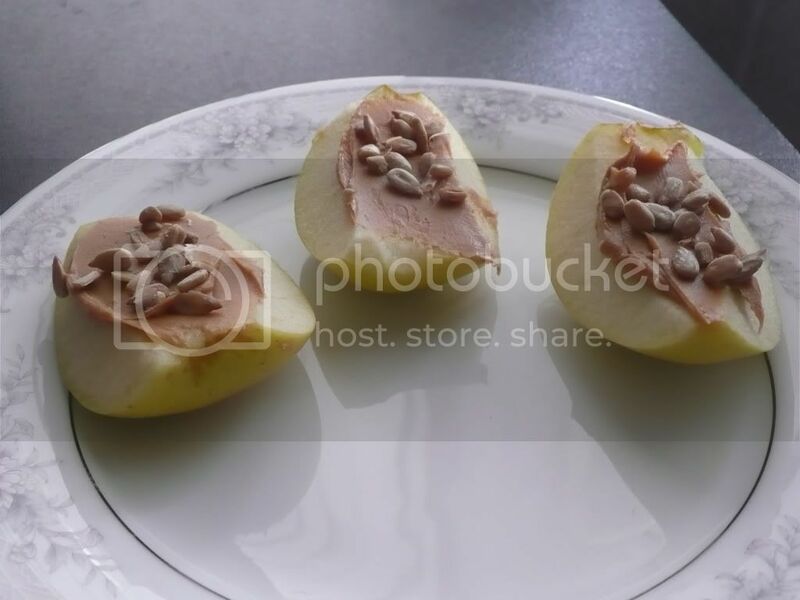 My favorite snack right now—Apple cut in to 4 pieces, topped with peanut butter & sprinkled with sunflower seeds. Nothing better!